When it comes to Halloween costumes, [Michael] doesn’t like buying expensive and poorly made bits of cloth and fabric that resembles [random Disney character]. Last year, his son decided to be a robot for Halloween and although gray spray paint and dryer vent hose make a very good costume, that only goes so far. The robot needed lights, so [Michael] spent a little time on this build that blinks a few LEDs in a random pattern. The build is very simple; an ATtiny13 drives two 74HC595 shift registers. The code – all 30-odd lines of it – uses the random() function to shift high or low values to the shift registers. After pausing for a little bit, the cycle continues and a new patterns of LEDs light up. The electronics of the robot costume could be easily transferred to another theme – astronauts need LEDs on their backpack, and of course aliens communicate with blinking lights. In any event, it would avoid last year’s fiasco with a dozen [Heath Ledger] Jokers. 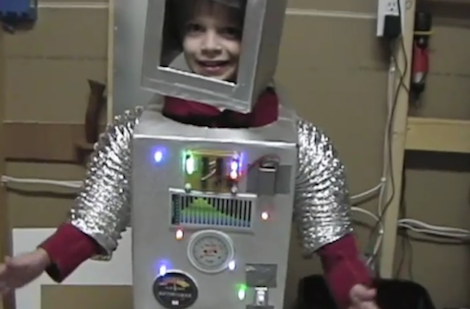 Check out the video of [Michael]’s intergalactic robot son after the break. HA, good for him. :) I hope [Michael] enjoyed making this as much as his son liked the costume. That smile is not going away for a while! I did that costume as a kid a few times not quite that fancy couple of boxes with tin foil few lights and an alarm is all i had. I hope the kid wants to be a giant walking eye next year. Swap that ATtiny out for a 555 timer, add a bit of digital logic, and you could make yourself a nice Linear feedback shift register giving you blinky lights with no micro needed. Probably a bit more pricey though, unless you don’t have any micro stuff. I developed a very similar robot costumer for my kid. He got claustrophic and had limited arm movement when trying to hit a pinata. I highly recommend making your costume big enough to the kid.